The second part to Latson’s method. 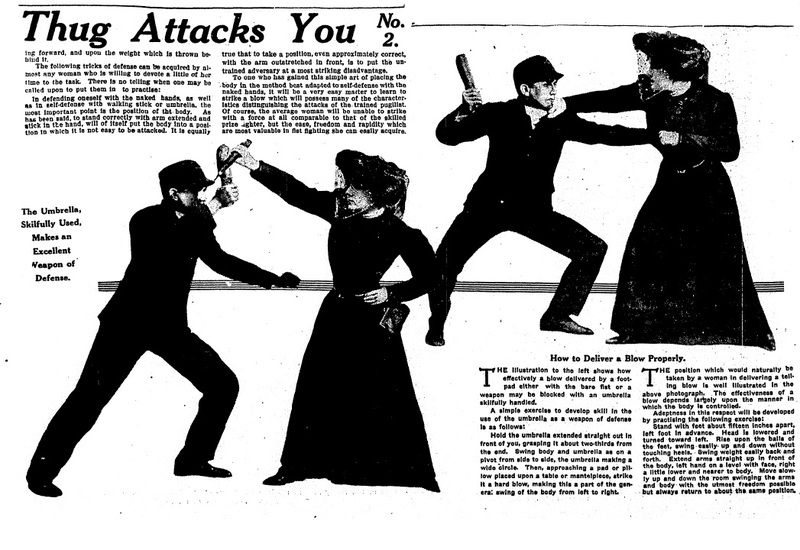 It seems that Dr. Latson’s Method of Self Defense made it to print more than once. This second article appeared in the Denver Post a week after the initial one in June 18th 1911. I haven’t been able to find any following ones. In defending oneself with the naked hands, as well as in self-defense with walking stick or umbrella, the most important point is the position of the body. As has been said, to stand correctly with arms extended and stick in the hand, will of itself put the body into a position in which it is not easy to be attacked. It is equally true that to take a position, even approximately correct, with the arm outstretched in front, is to put the untrained adversary at a most striking disadvantage. To one who has gained this simple art of placing the body in the method best adapted for self-defense with the naked hands, it will be very easy matter to learn to strike a blow which will posses many of the characteristics distinguishing the attacks of the trained pugilist. Of course, the average woman will be unable to strike with a force at all comparable to that of the skilled prize fighter, but the ease, freedom and rapidity which are most valuable in fist fighting she can easily acquire. The illustration to the left shows how effectively a blow delivered by a footpad either with the bare fist or a weapon may be blocked with an umbrella skillfully handled. Hold the umbrella extended straight out in front of you, grasping it about two-thirds from the end. Swing body and umbrella making a wide circle. Then, approaching a pad or pillow placed upon a table or mantelpiece, strike it a hard blow, making this part of the general swing of the body from left to right. The position which would naturally be taken by a woman in delivering a telling blow is well illustrated in the above photograph, the effectiveness of a blow depends largely upon the manner in which the body is controlled. Stand with feet about fifteen inches apart, left foot in advance. Head is lowered and turned toward left. Rise upon the balls of the feet; swing easily up and down without touching heels. Swing weight easily back and forth. Extend arms straight up in front of the body, left hand on a level with face, right a little lower and nearer to body. Move slowly up and down the room swinging the arms and body with the utmost freedom possible but always return to about the same position.